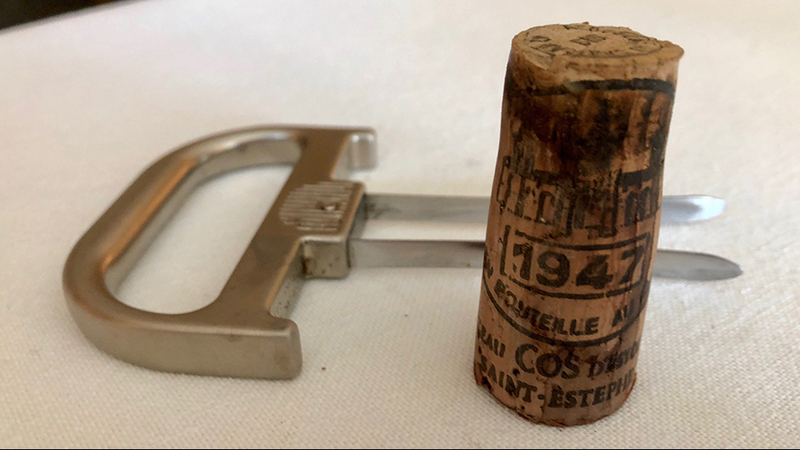 I look at the pristine bottle of 1947 Cos d’Estournel set in front of me during my most recent visit to the château and the unthinkable crosses my mind: “What if the bottle is corked, or off?” As much as I love tasting and drinking older wines, when bottles are very rare there is always a moment of suspense when the cork comes out. Fortunately, there are no such issues with 1947 Cos d’Estournel. At first a bit awkward, the 1947 blossoms gracefully in the glass. The bottle was opened just before we tasted it, and although that was not my decision, it is exactly what I would have chosen to do, because older wines can be quite fragile. But older wines can also surprise us with their ability to develop in the glass. Time dispels early notions of funk as the 1947 starts to find its focus and clarity with a few minutes of air. At 71 years of age, the 1947 Cos is naturally fully mature, with plenty of spice box, worn-in leather and dried fruit flavors. What impresses most is the wine’s depth and persistence, both of which it has in spades, signatures of a year known for having produced wines of tremendous richness. This bottle was pulled from the property’s stock and was re-corked at the château in 1993, which is indicated on the top of the cork. The earlier history is less certain, as this bottle appears to have been originally sold by négociant firm Nicolas. Personally, I find greater pleasure in wines when they are a bit livelier, but the 1947 is a real treat to taste and experience. 88/Drink now.